WHY GET EXCITED ABOUT A FLOOR DOOR STOPPER? These things are strong! And sturdy! It's attractive looking too, not like the big ugly rubber ones you see in office buildings or schools. They are not light-weight nor do they slide around on the floor. When you use these to hold a door open they stay put. They are very sleek and stylish looking and fit your decor perfectly. The rubberized exterior rim does not scuff the doors. This stopper will not scratch your delicate flooring,it can be used on carpet,wooden floors,or this door stopper also can be used on granite or concrete flooring. They have perfect non-skid on the bottom and won't move with the weight of the door. If you are dealing with higher lifted doors, the stoppers can be placed one on top of the other and will constitute the same reliable guard as taken alone. no matter if it's placed on hone,parquet, marble or granite. Its hardness will ensure dogs won't chew it and kids won't play with it. You don't have to be a handyman to install our door wedge! Just place them on the floor against your door and they will reliably hold your door open. A one-hand operation that saves your time and energy! for your robust doorstop to grip tightly on your tile, wooden floor or other floor, protecting it from scratches and unsightly damage! Please kindly check your door gap and product size before you purchase,thank you! NO TOOL, NO INSTALLATION REQUIRE - nstallation Needed door stops badly but did not want to drill the floor and wall？These stoppers are exactly what you should have.Just place them on the floor between the door and the wall.They have enough weight to hold the door in a moderate wind and it is easy to move with a little shove from the side of your foot. 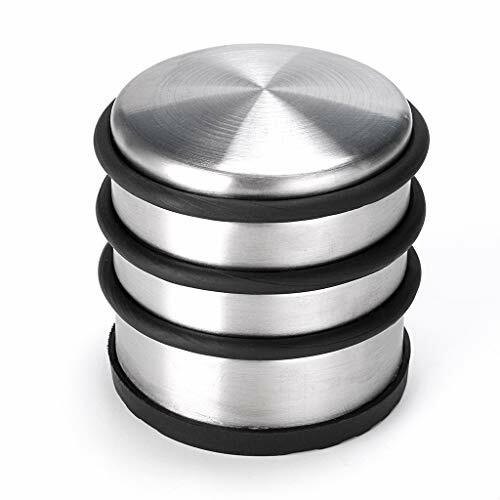 FUNCTION AND STYLISH STOPPER - These door stops have grippy, anti-skid rubber-ish material on the bottom along with a thick rubber band around the perimeter to prevent the stop from banging on the door.They look great sitting on the floor, stylish without looking institutional. Works well on door gap within the 2.4inch/6cm; Use these for regular indoor doors, bathrooms and bedroom, kitchen or office. To keep doors open don't worry your cat or dogs closing doors and locking herself in a room. And get the wind moving through the house on warm day. They are heavy enough to keep a door open and stylish enough to look good in any modern room. ATTRACTIVE DECORATIVE STOPPER FOR MOST DOORS - Tired of your doors swinging to and fro? An attractive door stop and don't need to go the permanent route of having to attach them to the doors. They are an attractive brushed nickel and look just fine sitting next to the door when not in use. Heavy stainless steel build,and rubber clamp. It is very easy to place and remove with one foot. These have an awesome look, and could go well with retro, contemporary, or modern style. WORRY ABOUT WARRANTY? - These door stop can work on all flooring surfaces including carpet, wood, tile, stone, concrete, laminate, and linoleum. Protecting your floors, doors and walls with their non-slip rubber bottom! Try our products for 30 days and if there are any quality problem,pls send us the email, we promise to offer you a prompt and full refund.